Availability and pricing £3.95 per issue; subscription offers available through www.modelaviationworld.com . 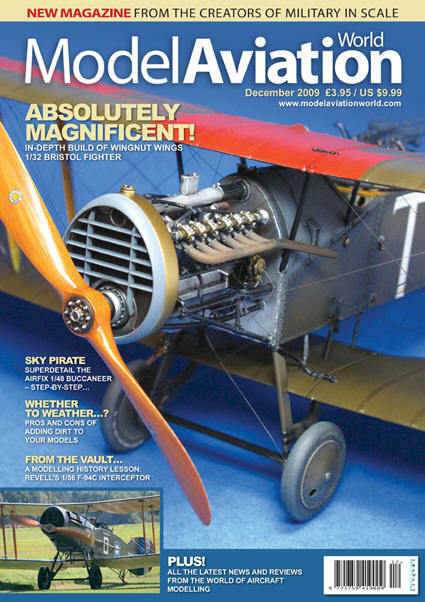 December marks a premiere of a new modelling magazine published in the UK – Model Aviation World. I have received the first issue for review, and here is a summary of my impressions. Although it’s a new title, Model Aviation World is created by the editorial team behind the well-known Military in Scale. Although mainly focused on armour and diorama modelling, Military in Scale has a long tradition of trying to cater for a broad range of modelling interests in a single title, ranging from aviation to figures. While this width made Military in Scale rather unique on the market, finding the right balance between width and depth of the magazine must have been rather difficult to the editorial team; in fact, it should come as no surprise that most modellers seem to stick to their particular field of interest, be it aviation, armour, or cars. The new magazine is intended to deliver purely aviation contents from the same editorial team, while allowing the Military in Scale to focus on vehicles, armour, and diorama. The first issue of the magazine is an expanded 84-page volume in A4 format. As can be expected from modern modelling magazine, the quality of print is very good indeed. The contents follow what one might expect from a publication in this genre. Part of the magazine is devoted to news about new kits, decals and modelling tools. A separate section offers book reviews. Then follows a series of richly illustrated features on various modelling projects. These range from out-of-the-box builds (Tamiya Mig-15) to advanced (Wingnut Wings Bristol Fighter) or even interestingly esoteric (Airfix old Dornier Do-17 converted to civilian courier version). Many articles contain step-by-step visual instructions which enable the reader to learn about and repeat the presented techniques. This, I’m sure, will be appreciated by many. The cover story (Brisfit) is accompanied by and a large atmospheric photo of the real aircraft on the centrespread. There is also a Colours & Markings feature (RAF Buccaneers), with many photos and colour profiles drawn by Mark Rolfe. In sum, this is a mature modelling publication with diversified, richly illustrated contents.